One song might be heard more than any other as Wolverhampton Wanderers fans make their way to Wembley Stadium this weekend for the team’s first FA Cup semifinal match in 21 years. For Mexico striker Raul Jimenez, his first season in English soccer is proving to be the most prolific of his career — and it can be argued no player in the country’s top flight is more important to their club than he is to Wolves. Since joining on loan from Benfica in the offseason of 2018, Jimenez has been directly involved in 48% of Wolves’ goals in the Premier League — scoring 12 and setting up seven more. According to data supplier Opta, it is the highest ratio of any player at a Premier League club. It was no surprise, then, that Wolves decided to exercise its option to sign the 27-year-old Jimenez on a permanent contract. It was announced on Thursday, with the reported club-record deal worth up to 30 million pounds ($39 million) being the perfect motivation ahead of the team’s most important match of the season against Watford on Sunday. His game has moved to another level at Wolves, which he might have joined because of the club’s strong ties with his agent, Jorge Mendes. As well as his impressive scoring numbers in the Premier League, Jimenez has also netted three times in Wolves’ path to the FA Cup semifinals that has included wins over Liverpool and Manchester United. He is firmly a fan favorite, with Wolves’ commercial department now delivering commentary of its games in Spanish to accommodate the extra interest in Jimenez. Jimenez is one of the faces of Mexican soccer these days, through his 3.17 million followers on Twitter and the fact that he has dated Daniela Basso, an actress in numerous Mexican soap operas, since 2017. His has also become a regular in the national team, scoring 17 international goals and playing at last year’s World Cup. 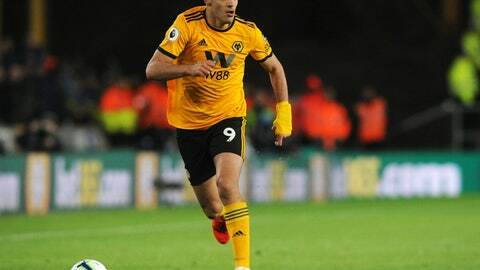 Indeed, his unselfish link-up play is a feature of his game, as exemplified with his deft through-ball to Jota for a goal in Wolves’ 2-1 win over Manchester United in the league on Tuesday. He is as strong with his back to goal as he is in front of it, and he has relentless work ethic that sees him constantly harrying defenders.